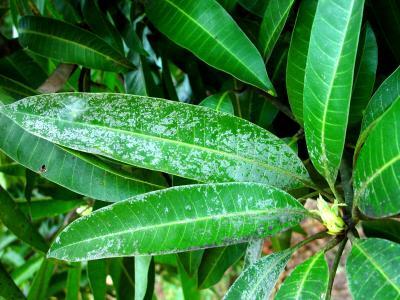 Mango leaf coating mites | Infonet Biovision Home. The mango leafcoating mite is tiny (about 0.2 mm), light coloured and cigar shaped. It cannot be seen with the naked eye. The mites leave in groups under a white coating on the upper leaf surface. The white coating can be easily rubbed off by hand. Leaves covered with the white coating tend to turn yellow and drop prematurely. In general, the coating has minimal effect on fruit yield. Remove and destroy leaves with white coating. Usually no further control measures are needed.